For her birthday, my youngest sister chose Tinder, a design by Jared Flood, and a bottle green Cascade 220 Heathers yarn for me to knit it in. Tinder is an A-shaped cardigan with raglan sleeves and a stand-up collar and will be perfect for autumn walks. 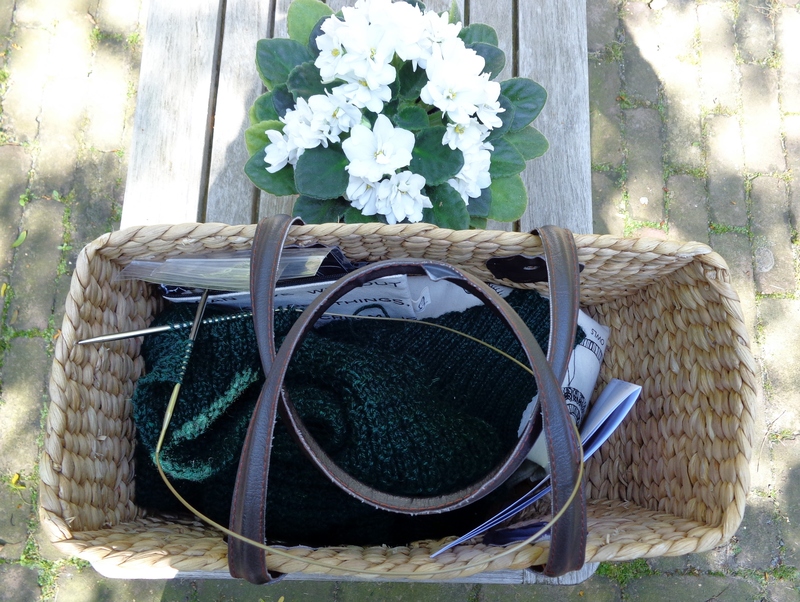 We maybe August and summer still very much with us, my knitting thoughts have already shifted to the next season and I’m hankering after warm wool in heathered shades. 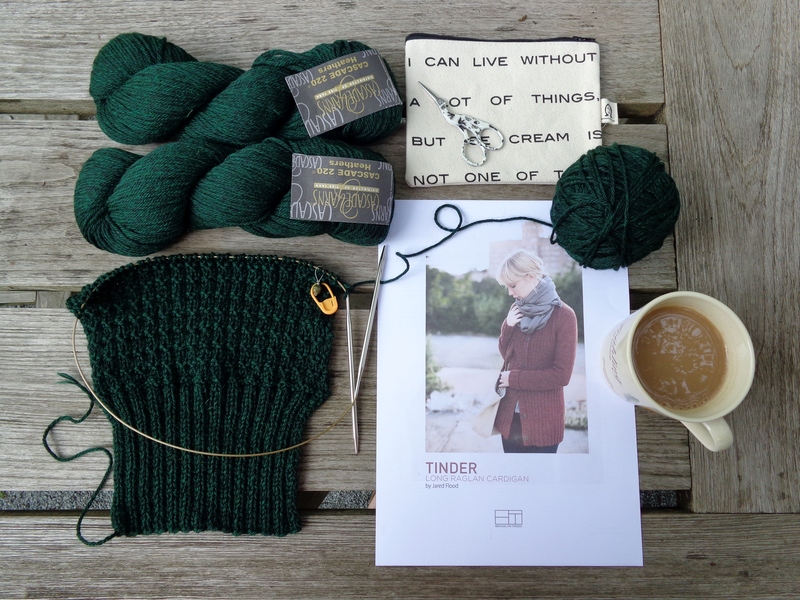 Tinder is designed to be knitted in separate pieces and I was too lazy to do the math and knit it in the round as some other knitters have done. But even if I feel slightly apprehensive about making the sleeve caps fit, I don’t really mind having to sew everything together. This is the first project I’ve knitted continental style! As a young child I was taught to knit English style by my grandmother and have always felt comfortable ‘throwing’. But ever since joining Ravelry and coming across so many enthusiastic continental knitters, I’ve been wanting to explore the continental style. I picked up a few tips and tricks from Youtube, but kept struggling with my tension. So I signed up for Patty Lyons Craftsy class ‘Improve your Knitting: Alternative Methods and Styles’ and that has really got me going. 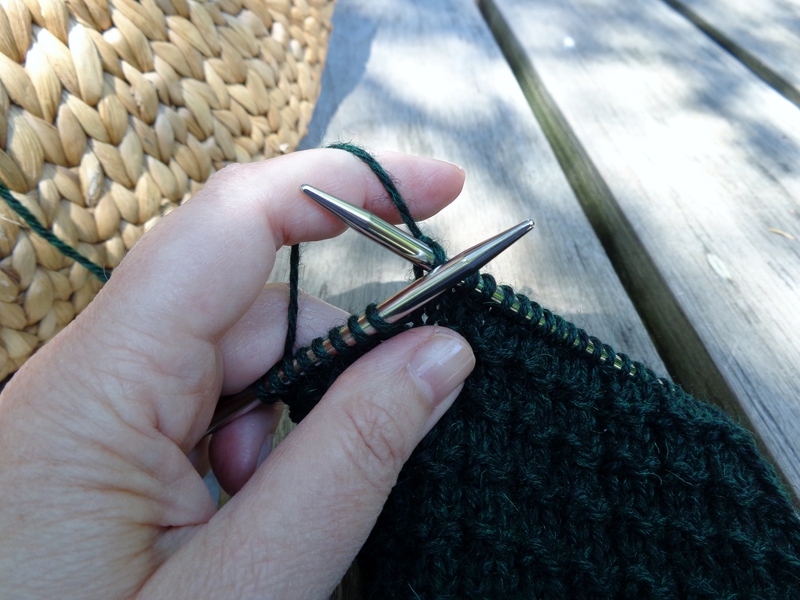 It is fun to be able to alternate both knitting styles and the continental style has definitely made the constant switching between knit and purl required by the waffle stitch pattern less tiresome. Wish you a very good week. Hope the sun is out where you are. Beautiful post as always and wow, that color looks fabulous! Love that gorgeous green. I learned to knit continental style and love it. I can and sometimes knit “American” style but tend to revert to the way I learned. Continental is such an efficient style, especially for stocking stitch. I’ll also probably revert to my first style when knitting something more complicated. It’s going to be lovely! And knitting it in pieces will give it more structure. I’ve always wanted to try my hand at knitting an entire project continental style. I know how to do it because I use it in fair-isle work, but haven’t had the “courage” to use it exclusively in an entire project.